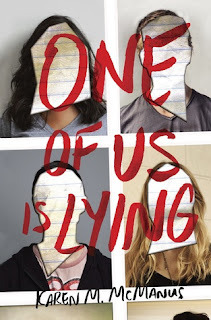 Review: Imagine an updated Breakfast Club with a twist of Gossip Girl, mixed in with murder. Told in alternating narratives, we follow four students who were in detention when their classmate Simon (i.e. the Dan of Gossip Girl, but everyone knows who he is), the student behind a malicious gossip site, is killed. They all have secrets, but who was willing to kill to keep them hidden? This was campy, fun and fast paced. I will def read more by this author.